The wave of social media and digital content is making its way into the funeral business. While tombstones have been around for centuries, marking the burial place of loved ones around the world, a Seattle-based company is taking things a step further and giving these stones a makeover. Quiring Monuments is including a small digital mark on the gravestones they make that link cemetery visitors to stories of the deceased’s life when they scan the digital stamp. Known as a "quick read," these codes allow family members to share information about their departed loved ones. These codes have been appearing in magazine ads for some time already and are only slightly bigger than a postage stamp. They look similar to a bar code combined with a Rorschach blot. When a person visits a cemetery that their loved one is buried in, all they need to do is bring a smartphone and download a free app that allows them to scan the image. Once scanned, the app will link them to a website that contains the personal messages and memories. This new digital technology is allowing families to connect with their past when they visit a cemetery, and the idea has already spread to other parts of the country. 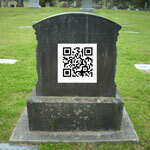 A Phoenix company has begun selling gravestones that contain RFID tags that are being used for digital storytelling. With the new generations’ fascination with new media, we expect other companies to follow suit and to see more digital markers on tombstones in the future.